Dimensions: H78 x W126.5 x D43 cm. 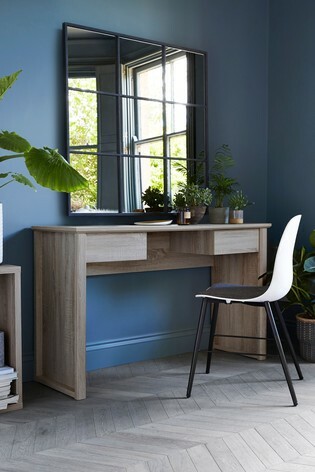 Material: Contemporary oak effect furniture with feature inset handles and side detail. Dimensions: H56.5 x W42 x D39 cm. Dimensions: H186.5 x W146.5 x D58 cm. Double: H129 x W162 x L207 cm. King: H129 x W177 x L217 cm. Super King: H129 x W207 x L217 cm. Additional information: With sprung wooden slats. Simple Contemporary Silver, Matt Velvet Steel, Glitz Pewter, Soft Velvet Graphite, Soft Velvet Pebble, Sumptuous Velour Silver: 100% polyester. Wool Blend Stone, Wool Blend Grey: 51% wool 30% viscose 19% polyester. Dimensions: H121 x W52.5 x D42 cm. Dimensions: H81 x W119 x D42 cm.